October 1-7 is officially designated as National Walk Your Dog Week! If you ask us, there is no better time than the Autumn season to get out and enjoy all of our areas’ unique natural wonders and historical landmarks with your pup! Besides the special bonding time you’ll get to share with your pet every day, a daily walking routine has several health and behavioral benefits for your pet (and you too!) Walking at least 30 minutes a day can help increase energy levels, reduce boredom, improve socialization, lower blood pressure, and keep weight in check. And don’t let a fenced-in yard stifle your motivation. Your pet will be mentally stimulated by the sights and sounds beyond the backyard, get to use muscles they normally wouldn’t use, and perfect their leash walking. Before you head out this fall, here are some tips for establishing a safe and fun walking program for you and your pet. Did you know that where you walk your dog is an important factor in determining the best vaccine protocol for your pet? For example, a dog that typically only walks on sidewalks in a more urban area will not have as high of a risk for exposure to leptospirosis as a dog that is walking on hiking trails. Leptospirosis is a contagious bacterial disease carried by wild animals such as deer, raccoons, mice, and cows. It is spread through an infected animal’s bodily fluids (urine, specifically) or by drinking contaminated water from lakes or streams. At Leesburg Veterinary Hospital we tailor vaccine protocols to each individual pet so that we are not “over vaccinating,” but providing the best comprehensive protection for that pet based on their lifestyle and risk factors. You can learn more about all of our recommended vaccines here. We recommend all of our pet patients take a monthly chewable or topical preventative to protect against fleas, ticks, and heartworm disease, including in the colder fall and winter months. Loudoun County has one of the highest rates of Lyme Disease in the country. Lyme disease is transmitted by the deer tick, a very hardy insect with peak population during the Autumn months. Heartworm disease is caused by worms that live in the pulmonary vessels (the vessels that carry blood to the heart and lungs) of infected pets and is transmitted by mosquitoes. 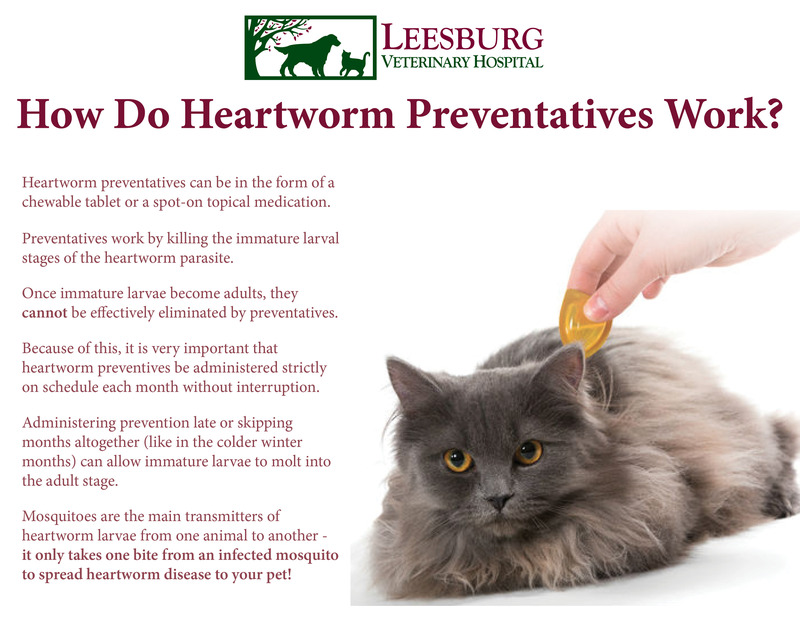 Heartworm preventatives work by killing the immature (larval) stages of the heartworm parasite. Once the immature larvae become adults, they cannot be effectively eliminated by preventatives. Because of this, it is very important that heartworm preventatives be administered strictly on schedule each month without interruption. By ordering your pet’s preventatives from our online pharmacy and setting up the “Auto Ship” option, you will never have to worry about running out or missing a monthly dose. Leave the retractable leash at home! 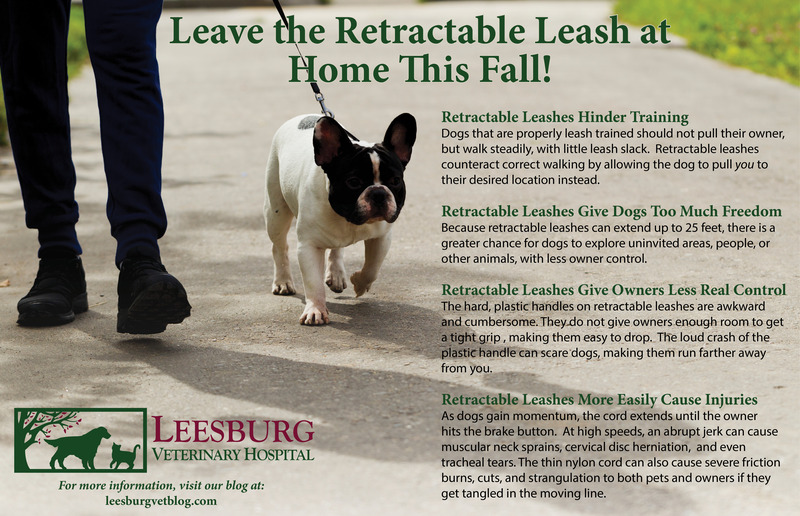 For the safety of you, other walkers, and pets, Leesburg Veterinary Hospital highly recommends using a standard 6-foot leash when walking your dog in public. In our article here, we go into detail on the drawbacks and dangers of using a retractable leash. We are so fortunate to live in such a beautiful area of the country with so many unique parks and greenspaces – there really is no excuse not to get out with your pet. Hopefully we’ll see you out there this fall! Red Rock Wilderness Overlook Park in Leesburg and Algonkin Regional Park in Sterling – both of these parks are a part of the Northern Virginia Regional Park Authority. The parks are open daily from dawn to dusk and include trails that follow along the Potomac River. 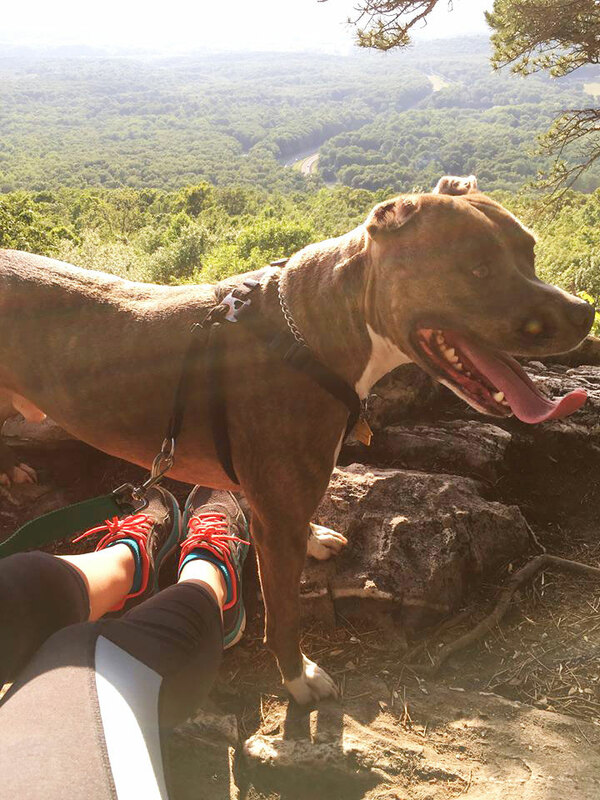 After your walk, your pooch can cool off in the river while you take in the breathtaking views and fall foliage. W&OD Railroad Regional Park – a 45 mile paved trail running from Shirlington (just north of Alexandria) to Purcellville along the old Washington and Old Dominion Railroad line. There are numerous access points along the entire trail and several parking lots in Leesburg and Purcellville. This trail is popular with bikers and even equestrians, so keeping your dog on a standard 6-foot leash is important here! Banshee Reeks Nature Preserve in Leesburg – Close to our practice, this 725 acre area includes woodlands, trails, and parts of the Goose Creek waterway. It is open on the weekends only – 8 AM – 4 PM. Franklin Park – A regional park in Purcellville, Franklin Park has two 3.5 mile-long trails, one dedicated for horses, and one where leashed dogs can join their two-legged friends. The National Mall in Washington D.C. – Sometimes it’s easy to forget that our nation’s capital is only 40 miles away! Pack a lunch and spend the day in Washington. Flanked by the Washington Monument, the Capitol Building, various memorials, and the museums of the Smithsonian Institute, you and your pet are sure to get a good workout, exploring the two miles of expansive greenspace, while taking in some of our country’s most specutular historical sights. Please note, dogs must be leashed on the Mall; they may go up to the monuments, but are not allowed under covered areas or indoors; dogs are not allowed on the walkways of the Vietnam and Korean War Memorials.